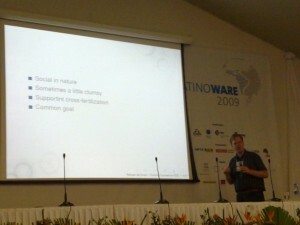 Latinoware was a nice conference held in the south of the country last week, from the 22nd to the 24th of October. 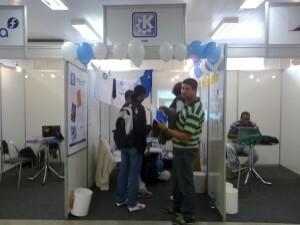 It was a really nice conference and we had a lot of KDE exposure there as we had our logo on the main website of the conference, a booth and also a lot of talks KDE/Qt related. It was really awesome that Ade and Annma could go there. It shows that Brazil and South America are not “3rd class citizens” in the community. A lot of people here in Brazil tend to think that we are not that special in the world besides our beaches and carnival. So, specially for students this is really important. Probably it’s also important for those that are at the beginning of their free software careers as they think ‘ow, a foreigner came here for KDE…this project must be important’. Ah, of course: it was also really a pleasure to have them here. Great great great people :). During my talk we had some people really interested in netbook stuff and it was nice to give this presentation as I did a similar one during GCDS but the one during GCDS didn’t have too much demos as everything was at the first steps. Now, with Marco working full time on this and some others that will join the team, I had a LOT of cool stuff to show off, not just the ideas behind everything. During GCDS I talked about the base ideas and research we did for Plasma Netbook. It was nice from a concepts point of view but I had no demos, just screenshots of pre-alpha versions and nothing fancy to show off. But this “pre-alpha” stage for the project was important so we could create a vision for the project and stick with it. Now, after some (few) months we have done a lot of things and the vision starts to show off. Instead of going on through all the details I’ll just explain the final demo of my talk: I had a netbook (with Plasma Netbook of course), running Amarok and playing some Cold Play song (bonus points for Cold Play that released a 5 songs live album for free on their website – funny fact: the music playing was ‘Viva La Vida’ , life is really great in KDE world, isn’t it 🙂 ? I had the now playing plasmoid on my Newspaper desktop and just shared it. Took an N900 from my pocket and showed how far KDE can go: using our technology I was able to ‘get’ the shared plasmoid, and remote control Amarok from my mobile phone (btw, thanks to Vudentz to let me use his N900 as I don’t have one yet).